Delhi: Saturday morning started with moderate fog in NCR region. It caused a delay in 52 trains (rail services) while around 12 were re-scheduled. Also, the unfit weather conditions negligibly affected flight operations as stated by the Indira Gandhi International (IGI) Airport officials. MeT department recorded visibility at 1500 meters at 5:30 am. However, it dropped to 400 meters at around 8:30 am. The minimum temperature recorded was 8.2-degree Celsius. It is normal taking winter season into consideration. On the other hand, the humidity was 92% at 8:30 am. According to a railway officer, 52 trains were running behind their respective schedules. 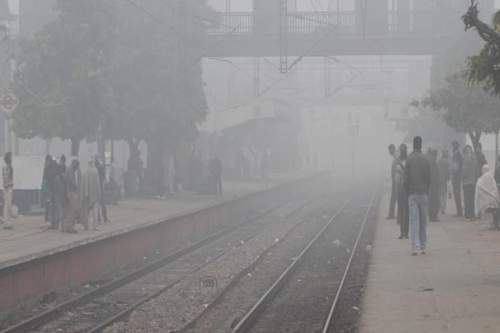 12 trains were rescheduled due to poor visibility by fog. Also, the Indian Meteorological Department said that skies would remain clear throughout the day. Moreover, he stated that the maximum temperature would go around 24-degree Celsius. 14.4-degree Celsius and 7.9 degrees Celsius were the maximum and minimum temperatures on Friday.